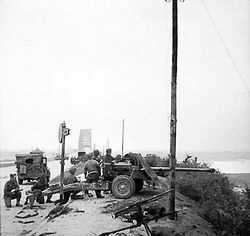 A British 17-pounder anti-tank gun at Nijmegen, in 1944. Anti-tank warfare refers to any method of combating military armored fighting vehicles, particularly tanks. The most common anti-tank weapons systems include artillery with a high muzzle velocity, missiles (such as wire-guided High Explosive Anti-tank (HEAT)), various autocannons that fire penetrating ammunition, and anti-tank mines. In addition, some helicopters are equipped for strikes against armored vehicles. In the area of anti-tank warfare, three terms are often used: "Mobility kill," "firepower kill," and "catastrophic kill." Mobility kill (M-kill) refers to the vehicle's loss of ability to move, such as when a tank track is broken. The target becomes immobile but may retain full use of its weapons and may be able to continue fighting to some extent. Firepower kill (F-kill) refers to some loss of the vehicle's ability to fire its weapons. M-kill and F-kill may be complete or partial, the latter referring to reduction in the target's ability to move or fire. A catastrophic kill (K-kill) removes the tank's ability to fight completely; it may entail complete destruction of the tank or disabling its weapons or crew. A German PaK 38 50-mm anti-tank gun. Small cannon and large-caliber rifles were used against the early World War I (WWI) tanks (such as the Mark I tank) being introduced by the British Expeditionary Force. Many of these weapons proved to be almost useless. Some weapons included the armor piercing 7.92 K Bullets, followed by a larger anti-tank rifle when those became ineffective. Grenades were also used, including the Geballte Ladung ("Bunched Grenade"), basically consisting of several regular grenades bound together. Tanks were also vulnerable to artillery and mortars, especially if they became stuck, which was no rare occurrence when they encountered difficult terrain or barbed wire, and they could be targeted more easily. By the end of the war, a number of light guns, typically 37 mm (in British terms "2-pounder"), were being deployed on short carriages that proved to be considerably better. In addition most forces deployed large, high-velocity rifles, typically of .50 cal (12.7 mm), with enough power to puncture the thin armor of the tanks of that era. Soviet 45-mm anti-tank gun (M1942). Anti-tank guns are designed to destroy armored vehicles. In order to penetrate the armor of tanks and other armored vehicles, they generally fire relatively small-bore shells at high velocity. Prior to World War II (WWII), anti-tank guns included both small, towed guns and anti-tank rifles. Few had (or needed) calibers larger than 50 mm. Examples of guns in this class include the German 37 mm, US 37 mm, French 25 mm and 47 mm, British 2-pounder, and Soviet 45 mm. All of these relatively light weapons could penetrate the thin armor found on most pre-war and early war tanks. At the start of World War II, many of these weapons were still being used operationally, along with a newer generation of light guns that closely resembled their WWI counterparts. These guns were increasingly less effective as tank armor improved. For instance, the German army had recently introduced a new lightweight 37 mm gun, whose users quickly nicknamed it the "tank door knocker" (Panzeranklopfgerät) once Soviet T-34 and KV tanks were encountered; all it seemed to do was announce its presence. All combatants quickly introduced newer and more powerful guns, and the anti-tank rifle declined in importance, although many were still in use as late as 1943. The "typical" towed gun by late 1942 was 50 mm or larger; the Germans had an excellent 50-mm high-velocity design, while the British introduced the "QF 6-pounder" which was adopted, with minor modifications, by the US Army as the 57 mm. A year later, sizes had grown due to pressure on the Eastern Front, German guns were now 75 mm and the famous 88 mm. The Red Army used a variety of 45 mm, 57 mm, and 100 mm guns, as well as deploying general-purpose 76.2 mm and 122-mm guns in the antitank role. The British 17 pounder was smaller at 76.2 mm but delivered its excellent amour piercing shell at high speed. German PaK 40 75-mm anti-tank gun. As the guns grew in size they dropped in mobility, making the dedicated anti-tank gun more vulnerable to enemy fire. Earlier weapons had been light enough to be moved a short distance by their crews. This was impossible with the much heavier weapons becoming common by mid-war. In addition to their lack of mobility, these guns offered almost no protection to the crew and were thus vulnerable to infantry and artillery fire. This gave impetus to the development of tank destroyers. These were generally lightly armored vehicles providing mobility and some protection against HE fire. These mobile AT guns were far more effective than their towed counterparts. By the end of the war, the concept of the dedicated conventional anti-tank gun was declining, with few new designs introduced after 1945. The guns were so large that they were essentially immobile. Instead, newer recoilless weapons and rocket launchers were developed. There were many types and kinds of anti-tank grenades. These ranged from hollow charge designs (e.g., the British No. 68 AT Grenade), to ones that simply contained a lot of explosive (the British No. 73 Grenade). To increase their effectiveness, some grenades were designed so that they adhered to the tank either through an adhesive (sticky bomb) or a magnet. The Germans used a magnetic grenade ("Hafthohlladung 3") to ensure that the hollow charge would fire at the optimal 90° angle to the armor. There was also a special type of grenade called the Nebelhandgranaten or "Blendkörper" ("smoke hand grenade"), which was intended to be smashed over an air vent and fill the tank with smoke, widely used by both sides in World War II. Molotov cocktails also saw much use, especially in Winter War, but mainly early tanks were vulnerable to them, and later tanks required a well-thrown bottle directly over the engine compartment to have any effect at all. The development in light (as in man-portable) anti-tank weapons took off during the Second World War. Most were based on the Munroe effect (or shaped charge) and called High Explosive Anti-tank (HEAT). The effect was the same irrespective of the speed of the round. The effect was also concentrated and could penetrate more armor than some of the larger anti-tank guns, yet weighed only a few pounds. The first HEAT rounds were rifle grenades, but better delivery systems were introduced: The British PIAT was propelled by a heavy spring and explosive charge, the U.S. Bazooka and the German Panzerschreck used rockets; the German Panzerfaust was a small recoilless gun. The HEAT warhead was retroactively used to convert the otherwise limited German 37 mm PaK guns to fire a large shell (that fitted over the barrel rather than in it) to a greater range than the Panzerschreck could manage. Another explosive related development was the High Explosive Squash Head (HESH), which went hand in hand with British work on recoilless rifles. HESH was a large weight of plastic explosive in a thin shell casing. It detonated on impact with the armor but only after having spread itself over the armor surface. The effect was to knock a similar size piece of armor off the inside, called spall, which would wreak havoc to the crew and internal components of the tank. After the war, research on infantry anti-tank weapons continued, with most designers focused on two primary goals; first, an anti-tank weapon that could defeat more heavily-armored postwar tanks and fighting vehicles, and second, a weapon lightweight and portable enough for infantry use. In the U.S., use of the 2.36 in. M9A1 rocket launcher or bazooka evolved into the more powerful 3.5 in. M20 Super Bazooka, which was used to good effect against North Korean armored spearheads during the Korean War. However, the M20 proved difficult and cumbersome to portage on foot over long distances. In the 1960s, the U.S. Army adopted the M72 LAW rocket, a lightweight, collapsible rocket launcher with the ability to penetrate moderate thicknesses of enemy armor. During Vietnam, the weapon was used primarily against NVA and Viet Cong defensive works and emplacements. Overall, the LAW was regarded as a success, though its ignition system frequently suffered from misfires in the heat and humidity of Vietnamese jungles. The tank is still vulnerable to infantry, especially in close country or built up areas. The armor and mobility of tanks also make them large and noisy. This can allow enemy infantry to spot, track and evade tanks until an opportunity presents itself for a counter-attack. Since heavy tank losses in some Second World War arenas, tank tactics have generally included close infantry support. Because tank crews have limited visibility, it is relatively easy for veteran infantry to get close to a tank, especially if the hatch is closed. If a crew member opens the hatch for the better visibility, he can be shot. An infantryman cannot be targeted by a tank's weapons when close, as the main gun and coaxial machine gun cannot depress sufficiently. Where tanks are operating in groups, this is less of a problem, since they can call on nearby tanks to drive off the infantry with light weapons. Whilst many hand-held infantry anti-tank rockets, missiles and grenades will not penetrate the front armor of a tank, they may penetrate the less heavily armored top, rear and perhaps the sides. Damage to the running gear can inflict a mobility kill. Tanks are also vulnerable to hand-placed anti-tank mines. Infantry have even immobilized tanks using a set of plates covered with leaves and dirt as dummy mines (the ruse being augmented by the crew's obscured vision). Infantry can then attack the stopped tank. This tactic was taught to the British Home Guard during World War II since they were not often provided with long-range anti-tank weapons. In addition, in built-up areas, the tank is very vulnerable to attack from above and sometimes from below, as the top and floor of the tank have the lightest armor. In some cases during World War II, a tactic of the Soviet infantry was to run directly up to a German tank, avoiding their main gun and mounted guns, and pour petroleum over and into the tank and light it, sometimes blocking the exit, burning the crew alive. Conventional artillery shells are not very effective against tank armor, except a direct hit by a sufficiently powerful shell. A non-penetrating shell can still disable a tank through dynamic shock, internal armor shattering, or simply by overturning the tank. In the last thirty years, however, a variety of artillery projectiles have been developed specifically to attack tanks. These include laser-guided projectiles, such as the U.S.'s now-canceled Copperhead CLGP (Cannon Launched Guided Projectile), which virtually guarantees a direct hit. Some of these CLGP's (such as the Copperhead) have HEAT warheads instead of common HE. Guided and unguided scatter munitions and submunitions have also been developed: A single artillery shell containing a number of smaller munitions designed to attack a tank. A six-gun battery might be able to fire several hundred submunitions in a minute or two. In one form, the shell bursts in the air above the tank and a number of shaped charge (HEAT) or HEDP (High Explosive Dual Purpose) bomblets or grenades rain down. Any that hit the tank have a good chance of causing damage, since they are attacking the thin top armor. Another form scatters a number of small anti-tank mines in the tank's path, which probably will not penetrate the armor but can damage a track, leaving the tank immobile and vulnerable. More sophisticated are submunitions with a homing capability. Once again the shell explodes above the tank position and dispenses a number of submunitions. The munitions contain some circuitry to identify tanks, such as IR or millimeter radar; when a tank is identified, a rocket propellant is fired to shoot the projectile at the tank. These munitions will often descend by parachute, to allow time for target acquisition and attack. All of the above but the CLGP can be fired from medium (122/152/155 mm) artillery, both tube and rocket. There has also been development of large caliber (81 mm and larger) guided mortar munitions with both internal (for example, IR or radar) or external (such as, laser designator) guidance. In the post-war era, HEAT became the almost universal choice outside of artillery and tank units. The British had developed the HESH, or high explosive squash head, warhead as an anti-concrete device for attacking fortifications during the war, and found it surprisingly effective against tanks. Like HEAT its effectiveness was the same at long range as it was at short range. In general, these systems allowed infantry to take on even the largest tanks, albeit at short ranges. But the short range of the delivery systems remained a problem. Increasing use of combined arms tactics allowed the attacking infantry to suppress the anti-tank crews effectively, meaning that they could typically get off only one or two shots before being countered or forced to move. The search for a suitable longer-range delivery system took up much of the immediate post-war era. The U.S. invested in the recoilless rifle, delivering a widely used 75 mm design, and less-common 90 mm and 106 mm designs (this last one was usually mounted on a jeep rather than hauled across the battlefield by infantrymen). The 106 mm formed the basis of a dedicated anti-tank vehicle, the Ontos tank, which mounted six rifles. The Soviet Union also built recoilless rifles in various calibers intended to be used as antitank weapons, most commonly 73 mm, 82 mm, and 110 mm (only the 73 mm remains in service with the Russian military today, though the other two can be found all over the world due to Soviet military aid during the Cold War). The British used a massive 120 mm (4.7 inch) design, the BAT series, which served from the 1950s until replaced by MILAN, but it was generally too heavy for infantry use and had to be towed by or mounted on a vehicle for maneuverability. The successor to the recoilless rifle lay in the development of the (wire) guided missile, or Anti-tank Guided Weapon (ATGW). Systems came into use in the late 1950s and 1960s that could defeat any known tank at ranges beyond that of the guns of the accompanying infantry. The United Kingdom, France, and other NATO countries were among the first to develop such weapons (for example, Malkara missile UK/Australia 1958). The United States was one of the last, coming up with the BGM-71 TOW in 1970, which was more powerful and easier to use than all the previous missiles, and eventually came to be the most widespread wire guided anti-tank weapon in the West. Of the world's major armies, primarily the Soviet Red Army, and some other countries retained antitank guns in significant quantities, mostly in 100 mm, 115 mm, and 125 mm calibers. The 125 mm antitank guns are extremely bulky and massive, and require large tractors to tow them for any significant distance, but they are relatively cheap and potentially deadly (particularly now that they have been upgraded with laser rangefinders and depleted uranium ammunition), though it is not clear what their tactical usefulness in many types of warfare would actually be. In Desert Storm for example, tanks set up in emplacements were very vulnerable to many weapon systems and could be spotted well in advance. In an environment with more cover they would be harder to spot. For a time it appeared that the tank was a dead end. A small team of infantry with a few missiles in a well hidden spot could take on a number of the largest and most expensive tanks. In the 1973 Yom Kippur War, Soviet first-generation wire-guided missiles being fired by the Egyptian forces inflicted heavy casualties on IDF tank units, a battle that caused a major crisis of confidence for tank designers. Some aircraft have been utilized to destroy tanks, starting in World War II with the Hawker Hurricane MK. IID, the Hawker Typhoon, the Henschel Hs 129, the Ilyushin Il-2, and the Junkers 87 Stuka G-1 and G-2; many aircraft, including the A-10 Thunderbolt II and Su-25 Frogfoot, have been specifically built for close air support, including tank destruction. They can use weapons similar to helicopters, large caliber anti-tank guns, air-to-surface missiles (such as the AGM-65 Maverick), and various bombs—unguided or laser-guided and with or without submunitions. British Army Westland WAH-64 Apache is an anti-tank helicopter. Anti-tank missiles were first used in a helicopter-borne role by the French in the late 1950s, when they mounted SS.11 wire-guided missiles to Alouette II helicopters. While initially, there were many teething problems, the possibilities where clear, such as providing the ability to attack the more lightly armored top of the tank. Some claimed that the tank was essentially obsolete at that stage. There has not been tank and helicopter combat between evenly matched forces for many years, so this conclusion may be premature. In any case, the anti-tank helicopter armed with ATGWs (Anti-Tank Guided Weapons) or anti-tank cannons is one of the biggest threats to a modern tank. The helicopter can position itself where it is not easily seen from a tank and then attack from any quarter, exposing the weaker parts of the tank's armor. The limited visibility from a closed-down tank also makes sighting a helicopter more difficult. Most helicopter-launched ATGWs have sufficient range that they can under the right conditions be fired at a range too long for the tank to retaliate with its own weapons. This may change with the Israelis fielding the Lahat missile that can be fired from the main gun of the Merkava MBT. With both anti-tank and anti-helicopter role, it does level the playing field somewhat. The Indian Arjun tank has also been modified to fire this missile. The People's Republic of China has developed 100 mm gun-launched missiles based on Russian designs such as the GP2 (based on the Russian Bastion or AT-10 Stabber). It has been reported to have successfully engaged aerial targets, as well as being an anti-tank missile. Similar missiles are available for Chinese tanks equipped with the 105 mm gun. The Russians have also displayed a similar if more advanced system in the Reflex. The system involves an automatic targeting of an aerial/land target instigated by a laser warning system. Although putting weapons on helicopters (probably) dates back to the 1955 with the Bell 47; the first specific anti-tank, attack helicopter that went into mass production was the Bell AH-1 Cobra in 1966. Prior to WWII, a variety of improvised and dedicated weapons drove tactics. Initially, during WWI, light field pieces were deployed in the frontline trench system to fight tanks. These weapons could generally knock out a tank but were themselves vulnerable to artillery fire. Their position in the forward area made them vulnerable to loss also, and their use denuded regular artillery units of some of their firepower. Engineer obstacles were perfected by the interwar years. Obstacles consisted of natural features such as ditches, streams and urban areas, or constructed obstacles such as anti-tank ditches, minefields, dragon's teeth, or log barriers. Obstacles were labor-intensive to construct and were not intended to stop an attack by themselves. Instead, the goal was to slow down the attacker, force them to conduct deliberate breaching operations with engineer support, and possibly cause them to reorient the direction of their attack into some better-defended area. Any delay on the attacker's part allowed the defender to move reinforcements into the threatened area and to learn the attacker's intentions. To be effective, all obstacles had to be covered by fire from other weapons systems. For example, a minefield may slow tanks down and force engineers to deploy on foot to clear it; mortar fire can then be used to defeat the engineers. Anti-tank rifles were developed also. By the beginning of WWII, anti-tank rifle teams could knock out most tanks, and do so with a weapon that was man-portable and easily concealed. However, the upper limit on AT rifle performance meant that by mid-war, most tanks had armor sufficient to defeat their projectiles. The AT rifle teams were also vulnerable to virtually every weapon on the battlefield. Even under the best circumstances, AT rifles were also very short-range weapons requiring great courage from their gunners. During WWII, the Japanese forces employed satchel charges and pole-mounted anti-tank mines dubbed "lunge mines." Although the charges could knock out any allied tank, the tactic was extremely close-range, and the sappers were vulnerable to all allied weapons. Towed antitank guns were thought to be the primary means of defeating tanks. At Kursk, for example, the Red Army deployed more artillery regiments than Infantry regiments, and towed gun densities reached over 20 guns per kilometer of defended tactical zone. A towed gun was much cheaper than a tank, and could be concealed in a shallow position. When time allowed, dugouts with strong overhead cover could be constructed. Guns deployed on reverse slopes and in flanking positions could take a toll of attacking tanks. However, gun crews were vulnerable to artillery and mortar HE fire and enemy infantry. Their positions had to be carefully selected and, once engaged, they could generally not redeploy. US Army experience strongly suggested that towed AT guns were less effective than self-propelled AT weapons and took heavier casualties. Self-propelled anti-tank guns were rare at the beginning of WWII, although the Belgian army deployed a few T.15 tank destroyers and the French army was developing several wheeled and tracked designs. The advantages of mobility and even thin armor protection were so compelling, however, that most armies were using self-propelled AT guns by mid-war. Examples of these weapons included the U.S. M10, German Marder II, and Soviet SU-85. The Korean War highlighted the difficulties that can arise with tank forces when vulnerable logistical support is combined with poor terrain. In the early stages of the war, North Korea's well-equipped tank divisions were pushed back to the Yalu River, the border with China, by superior American tank power combined with air and infantry support. However, when the Chinese entered the war, they managed to reverse the American advances with infantry power alone. Because of the terrain and the need to keep the tanks supplied, American tanks were limited to two main roads. The Chinese merely occupied the land between the roads and harried the American supply lines and troop transports along the road. The Chinese infantry stuck to land that was impassable to tanks, such as rocky prominences and rice paddies, neutralizing the advantage of both American armored divisions and air support. As bad as it looked for the tank in the 1960s, increases in depth of armor and improvements in armor technology meant that hand-held systems were no longer large enough to deliver enough power by the 1970s, and the introduction of Chobham armor by the UK and reactive armor by the USSR, forced the HEAT rounds to be so large that in many cases they are not man-portable. Today the anti-tank role is filled with a variety of weapons, from portable "top attack" missiles, to larger HEAT missiles for use from jeeps and helicopters, a variety of high velocity autocannon, and ever-larger heavy tank guns. One of the first lessons of the 2006 Israel-Lebanon conflict was the effectiveness of portable antitank missiles, particularly the Russian-made Metis-M and the European MILAN. ↑ Helicopters at War (Leicester, UK: Blitz Editions, 1996, ISBN 1856053458), 63. ↑ Lone Sentry, New weapons for Jap tank hunters. Retrieved November 9, 2008. Diez, Octavio, Eva M. Duran, and Jennifer Murray. 2001. Anti-Tank Weapons and Military Vehicles. Poole, UK: Chris Lloyd. ISBN 8495323303. Hogg, Ian V. 1996. Tank Killing Anti Tank Warfare By Men. London, UK: Sidgwick & Jackson. ISBN 0283062851. Norris, John. 1997. Anti-Tank Weapons. Herndon, VA: Brassey's. ISBN 1857531779. This page was last modified on 5 April 2016, at 15:10.